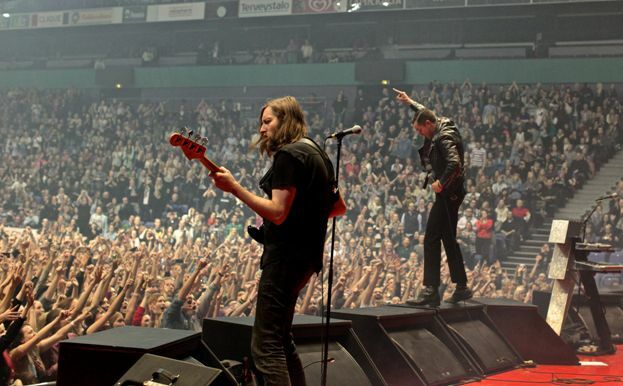 From the fabulous Las Vegas, Nevada, came the American rock band The Killers to put some sunshine into the cloudy Finnish winter. As its charismatic vocalist Brandown Flowers asserted at the beginning of the show “It had been too long Helsinki” and the people of the capital were really eager to see them live. It was not actually that my impression when I was walking the few meters that separate Pasila Train Station from Hartwall Areena, the venue where the concert was about to take place a few minutes later. Just a bunch of fans were pacing fast towards there, so I imagined that the venue was going to be half empty, being a tuesday evening. Far from reality, it must have been actually my fault for arriving a bit late and missing the opening band Louis XIV, because actually Harwall Areena was almost fully packed with fans, many of them female, eager to move their feet. And they have a good change right from the start to shake the body, with the band starting strong with Mr. Brightside, continuing with some other infamous themes you must have listened to countless times in the radio stations or at the nightclubs like Human or Somebody Told Me. It is undoubtedly Flowers the one who carries on with the charismatic part of the band. With his neat appearance in leather jacket and perfect haircut, he has this look of healthy young American boy with a touch of mischief in his gestures that get both the approval of the mothers and the screams from the young girls. Alternating fast pace songs with some other slow intimate moments with dimmed lights and Flowers on the piano, the band produced a solid show, if not to be remembered as outstanding, at least totally satisfactory to have a couple of hours of a good time listening to light heartening music and some touching moments like when Branson dared to sing a cover of “Forever Young” infamous song. Of course, after the first part of the show, it was compulsory for the band to come back to the stage for an encore of 3 songs and put the cherry on top of the cake with Battleborn and Flowers jumping to shake the hands of most people in the front row. Good show and good impression for being the first time I saw The Killers onstage, a band that transmit the feeling to know what they want.